lyndon taylor wrote: You have to ask yourself, if the Buddha were alive today would he vote for the gold dome?? and I think from what we know of his opinions on such in scripture, the answer would have to be a resounding NO!! The Buddha doesn't get to vote on this. If people want to donate gold to him he will refuse it, but if they want to donate it to a pagoda it is not his business. When Visākhā donated the Migāramātupāsāda it cost 90 million, and the site on which it was built cost the same. The Buddha accepted the monastery, together with its lavish furnishings. mahat wrote: The greater beauty of the monument will lure more tourists which will help the local population who are really, really poor. This is true. I have seen this here in the U.S. Shambhala Mountain was somewhat known as a Vajrayana retreat center in the Colorado Rockies. After they built the 108 foot stupa, people flocked and it is one of the most famous retreat centers in the U.S. I have seen tour buses come and they receive donations from tourists going on tours of the place. The same is true for HSI-LAI in Los Angeles. Groups of people, even non-Buddhists come to see the huge facility. As the saying goes, "give a man a fish, feed him for a day; teach a man to fish, feed him for life." That would be great if the generosity the Thai people are doing ends up in greater tourism and business for the people in Bihar. I'm honestly not entirely sure we can know for certain that the Buddha would say much about it at all... that would be a bit like telling people what to do do with money, which if I'm remembering the Vinaya rules right, is not allowed. I agree with you for the most part, but it is also none my business to tell people what to do with their money. throwing it at someone else; you are the one getting burned." lyndon taylor wrote: You have to ask yourself, if the Buddha were alive today would he vote for the gold dome?? Why would anyone vote on what someone else can do with their generosity? Choose your own place for your own generosity and let others do what they want with their generosity seems pretty common sense to me. I don't know that I would want to be quoted saying my opinion or vote on a matter is more important than the buddha's. Seems in the scriptures I remember the Buddha teaching he did not want to be honoured by stupas or statues. Are we to argue that honouring the buddha is more important than following the directions he gave?? lyndon taylor wrote: Seems in the scriptures I remember the Buddha teaching he did not want to be honoured by stupas or statues. Are we to argue that honouring the buddha is more important than following the directions he gave?? I'll save you the trouble of looking for the reference. There is none. The Buddha never forbade statues or stupas. The first representations of the Buddha-Dhamma were footprints or the Dhamma Wheel, but not due to any rule. A specific reference from the Mahaparinibbana Sutta is that layfolk would deal with all of that funereal stuff & that monks weren't to bother themselves over such things. There weren't any stupas back then like nowadays - they were probably more akin to earthen mounds. Stone chaityas and stupas probably arose later due to Dharmaguptaka influence, and then only in the northwest, at first. I don't know how reliable this source is, but it definetely isn't the first time I've read in the literature that the Buddha did not want to be honoured by statues or temples. Osho; definitely not a reliable source. That is the Rajneesh cult. 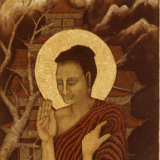 It was/is a common misconception about the Buddha. There is no source for that any where in the Tipitaka. lyndon taylor wrote: I don't know that I would want to be quoted saying my opinion or vote on a matter is more important than the buddha's. Seems in the scriptures I remember the Buddha teaching he did not want to be honoured by stupas or statues. Are we to argue that honouring the buddha is more important than following the directions he gave?? He trains perfectly those who wish to be trained; he is Teacher of gods and men; he is Awake and Holy. " Leading to liberation, to be experienced individually by the wise. " 26. "The body of a universal monarch, Ananda, is first wrapped round with new linen, and then with teased cotton wool, and so it is done up to five hundred layers of linen and five hundred of cotton wool. When that is done, the body of the universal monarch is placed in an iron oil vessel, which is enclosed in another iron vessel, a funeral pyre is built of all kinds of perfumed woods, and so the body of the universal monarch is burned; and at a crossroads a stupa is raised for the universal monarch. So it is done, Ananda, with the body of a universal monarch. And even, Ananda, as with the body of a universal monarch, so should it be done with the body of the Tathagata; and at a crossroads also a stupa should be raised for the Tathagata. And whosoever shall bring to that place garlands or incense or sandalpaste, or pay reverence, and whose mind becomes calm there — it will be to his well being and happiness for a long time. 27. "There are four persons, Ananda, who are worthy of a stupa. Who are those four? A Tathagata, an Arahant, a Fully Enlightened One is worthy of a stupa; so also is a Paccekabuddha, and a disciple of a Tathagata, and a universal monarch. 28-31. "And why, Ananda, is a Tathagata, an Arahant, a Fully Enlightened One worthy of a stupa? Because, Ananda, at the thought: 'This is the stupa of that Blessed One, Arahant, Fully Enlightened One!' the hearts of many people will be calmed and made happy; and so calmed and with their minds established in faith therein, at the breaking up of the body, after death, they will be reborn in a realm of heavenly happiness. And so also at the thought: 'This is the stupa of that Paccekabuddha!' or 'This is the stupa of a disciple of that Tathagata, Arahant, Fully Enlightened One!' or 'This is the stupa of that righteous monarch who ruled according to Dhamma!' — the hearts of many people are calmed and made happy; and so calmed and with their minds established in faith therein, at the breaking up of the body, after death, they will be reborn in a realm of heavenly happiness. And it is because of this, Ananda, that these four persons are worthy of a stupa." That gilding the spire would benefit the poor people of the region through increased tourism is an interesting idea. First, does anyone really think that gilding the spire will appreciably increase tourism?........are people not going to visit the temple because it is too ugly and blinging it up like a Las Vegas casino will make the difference? If it will attract people interested in seeing the bling are these the kinds of tourists we want to attract? And if this is the way we want to attract more tourists do you really think that the poor people of the region will benefit? Seems like those already in a business catering to tourists (I'm assuming there are already lots of tourists going there with businesses catering to them) will just make more money and the trickle down to the poor will be marginal. If we accept that perhaps some poor people will be helped then if a group of Thai Buddhists wanted to fund the largest Golden Arches in the world and put it right across the street from the temple and establish the largest McDonalds hamburger stand in the world there should we whole heartedly agree that it's a good idea as it will help the poor people in the area? Should we be enthusiastic about gilding famous religious structures around the world to increase tourism and thus help the poor people of the area......places like the wailing wall in Jerusalem?......that wall looks pretty shabby and could use some blinging up don't you think?......we could go with the McDonalds too with posted assurances that there is no ham in hamburger! What about historical significance of the very old temple structure, can you imagine the uproar if someone proposed gilding the crown of the statue of liberty?? lyndon taylor wrote: What about historical significance of the very old temple structure, can you imagine the uproar if someone proposed gilding the crown of the statue of liberty?? Actually, the Statue of Liberty has gone through some renovations over the past decades. It is not a religious structure. And it would be funded by U.S. tax dollars so in that case, the citizens would have some say if that should be done or not. Irrelevant. The Jewish people are waiting for the messiah to come before they do any renovations or to build the Third Temple at the Temple mount in Jerusalem. In Buddhism, we don't need to wait for a messiah or even another samma-sam-buddha to do renovations or to build a temple. It is up to the donors where to put their funds.